HEXUS has been watching the development of the all-new Atari VCS with some interest. The new Linux-powered machine seems to deliver quite a bit more than a 'console', and indeed VCS is an abbreviation of Video Computer System. Today we have some good news and some bad news about the project. In brief, the good news is that the machine is getting a much newer as-yet-unannounced processor, and the bad news is that the change will require some delay to the availability of the Atari VCS. Processor: AMD SoC with Bristol Ridge A10 CPU and Radeon R7 GPU. Memory: 4GB DDR4 RAM, 32GB eMMC storage. Other: 4-mic array, rechargeable joysticks connect via Bluetooth or USB C.
Physical: 14.5" x 5.3" x 1.6", 3 lbs, Plastic - Metal - Wood construction. The big spec change trumpeted by Atari concerns the processor. It says that it made the decision to upgrade the processor "in partnership with the team at AMD," to make the VCS a more attractive proposition. In place of the aging Bristol Ridge APU bullet pointed above will be an unspecified future processor from AMD built on 14nm. Atari says the processor will feature two Zen cores plus the "high-performance Radeon Vega graphics architecture". The attractions of the newer processor are several fold, with it expected to be "faster, cooler, and more efficient," bringing benefits not just to performance but design of the VCS (compact thermal design, lower noise). Ethernet, Native 4K video with modern HDCP, and a secure frame buffer that fully-supports DRM video (Netflix, HBO, etc.) are all features supported by the unannounced AMD processor / chipset. Atari had promised to ship the $329 VCS during 2018 and IndieGogo backers have been patiently waiting but it looks like they, and others, will have to wait about a year beyond their initial expectations. The latest timeframe signalled by Atari is of a "delivery window... at the end of 2019 for Indiegogo backers". 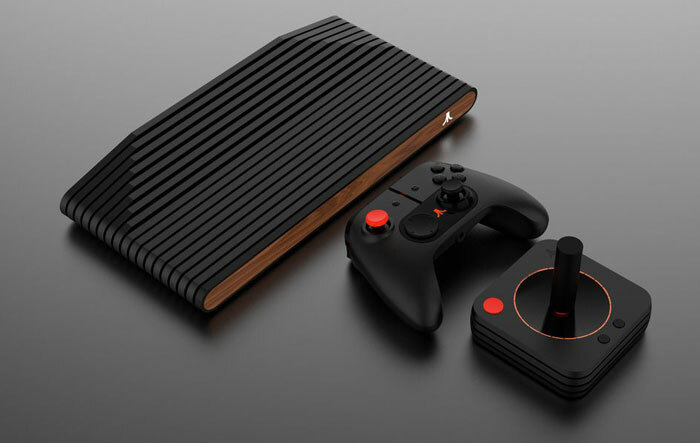 Atari promises to keep those interested and its crowdfunding backers up to date with regards to the processor, the newfound performance, the refinement of the VCS user experience, game and media partnerships, and to narrow down the hardware shipping schedules as the year progresses. Just to see whether the plastic is thermosetting or thermoplastic…. i.e. will it burn or will it melt?